Today's Sunday flashback isn't to one of my most popular posts, but it is a post that I particularly enjoyed and still use in my real life. 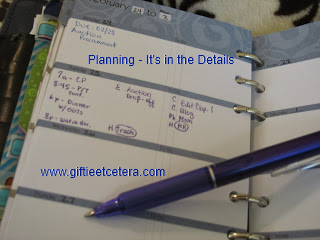 Click Planning - It's in the Details to read this classic Giftie post. A couple of years later, and these planner tips have been tested and hold up over time. I no longer write FYIs in a highlighter color (as I just mark them FYI and use highlighters to cross out). I still circle most repeating tasks, but use repeating task tabs for some of them instead. Otherwise, though, everything is the same. That means these planner tricks work! Which of these do you plan to adopt in your planning or notetaking? Love how your tips and posts are always practical. Pretty planners are fun, but I love tips on how to utilize planners as a tool the best!